How would scientists power moon colonies? Read on to learn more about NASA’s new nuclear fission Kilopower. How much electricity would it take to power an entire colony on the moon? Currently, spacecraft like the Opportunity rover use nuclear fission to create electricity. However, it does not create enough to power a colony. Consequently, scientists needed to find a solution to the problem. In May of 2018, NASA announced it had completed the ground tests of a fission reactor for space. It can supply 1,000 watts of electrical energy and up to 10,000 watts for moon colonies. NASA and the U.S. Department of Energy (DOE) collaborated to create a space-ready nuclear reactor, which harvests energy from active nuclear fission, or atom splitting. 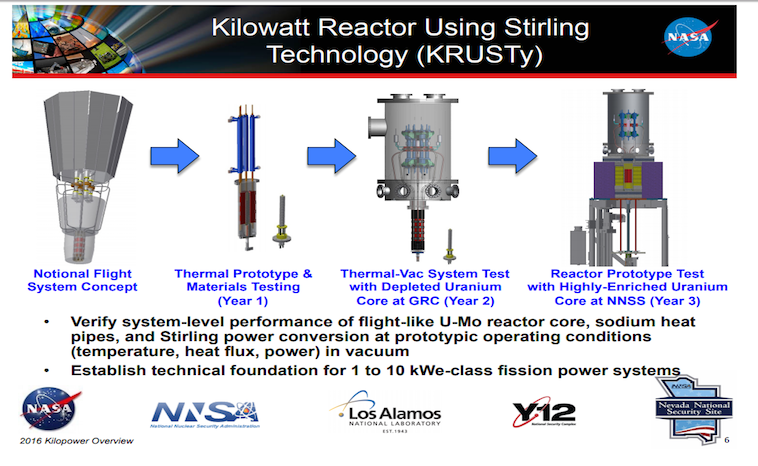 NASA and DOE officials announced the completion of successful ground tests of the experimental reactor, called the Kilopower Reactor Using Stirling Technology (KRUSTY). The team tested the reactor at the DOE Nevada National Security Site in four phases. The first two were conducted without power, to ensure that the components reacted as expected. During the third phase, the team gradually increased power to heat the core. The final phase consisted of a 28-hour, full-power test that simulated an actual mission. The reactor consists of an enriched Uranium core that is undergoing fission decay. Heat pipes extend out from the reactor and connect to sterling engines. Next, these engines convert the heat into electrical energy. The entire system self-regulates. If the reactor overheats the engines can draw off more power to cool it back down. On the other hand, if it is too cool, the core contracts increasing the rate of fission again. Now that the ground tests proved successful NASA plans to test them in space. Four units could provide enough power to establish an extraterrestrial outpost. Scientists have the ability to tailor the reactor to meet energy demands. It can remain dormant during launch and travel and turn on once it reaches its destination. Furthermore, a Kilopower generator could maintain its 1-kilowatt output for at least 10 years, NASA officials said in a statement. What would happen if they launched this and it broke up within Earth’s atmosphere? NASA stated that they have set protocols in place within the rules of the United Nations. Additionally, the reactor will not be turned on until it is far away from Earth. “We’ve done calculations to show that, under all worst-case conditions, we don’t believe that there’s any chance the reactor would come on accidentally, [even] during a launch accident”. (NASA, 218) At the same time, NASA has to consider the safety of the moon colony. How would they protect the astronauts living at one of these KRUSTY sites? A development team is researching mechanisms to shield astronauts from radiation that the reactor may emit, including building in protection and burying part of the reactor under the surface. This new technology will help a colony run all their experiments from one of the planned outposts one day. They will also have the ability to transmit those results back to Earth. NASA also believes that can install this technology on spacecraft that use ion engines. This would help with deep space missions into the next century. NASA has proved once again how powerful dedication to space exploration can develop new technologies.